Nevertheless, the prospect of such an extremely strong decline is scary: what use is it to anyone if markets typically perform well in October most of the time, when the phenomenon of the gains of an entire year evaporating in the blink of an eye is repeated? What about intermittent losses? We will apply seasonal analysis to the issue in order to shed light on whether one should adopt a risk-averse stance in October. Let us take a look at the largest declines in recent history. The following chart shows the twenty largest one-day declines in the Dow Jones Industrial Average. Crashes that occurred in October are highlighted in red. 9 of the 20 strongest one-day declines happened in October. That is an extremely disproportionate frequency. In other words, October has a strong tendency to deliver negative surprises to stock market investors in the form of sudden crashes. What does this mean for us as investors? What to Make of Exceptionally Large Gains? First of all, the first half of the year appears to be much safer from sudden declines. Only two of the 20 largest one-day losses happened in these six months. But what is the takeaway for us? We must not allow to let ourselves be deceived. Even though such extreme price declines are rare, they do exhibit seasonal tendencies as well. Although it is more likely in most years that gains rather than losses are generated, the losses frequently turn out to be exceptionally large. Despite the fact that large price declines frequently happen in October, it is at the same time not a weak month on average. 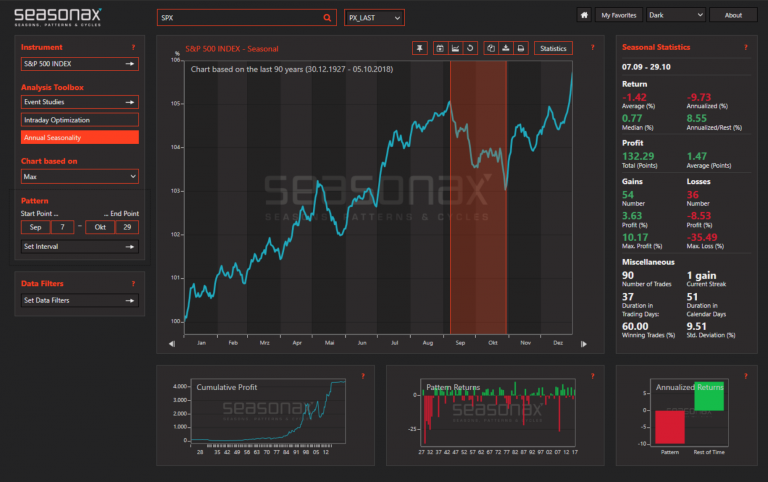 We have used the Seasonax App to carry out a seasonal analysis for the Dow Jones Industrial Average. The results are depicted in the seasonal chart below. Contrary to standard price charts, seasonal charts do not show actual prices over a specific time period. They rather show an average of prices over a large number of years in relation to the time of the year. The chart on the following page illustrates the average annual price pattern of the DJIA calculated over a span of 29 years. The chart illustrates the typical seasonal price pattern of the DJIA. As can be seen, statistically the weakest month is actually September rather than October (see also: “September – the Most Dangerous Month to Invest”). In the course of October the market tends to move sideways on average. Net-net it even exhibits a small gain, albeit a well below average one. Nevertheless, October delivers a better average performance than its reputation among stock market participants would suggest. Of course this reputation is not entirely undeserved, given that it stems from the fact that particularly large short term declines actually do frequently occur in October. This seasonal analysis was carried out with the aid of our web application, which was launched several months ago. One no longer has to have access to Thomson Reuters Eikon or a Bloomberg terminal, instead this version can simply be accessed via a normal web browser. In short, we have made this powerful tool for analysis available to anyone with a functioning internet connection! Simply access the Web App of Seasonax here and give our free patterns a try. It will help you optimize your portfolio with a view toward avoiding or reducing exposure to extreme seasonal risks. 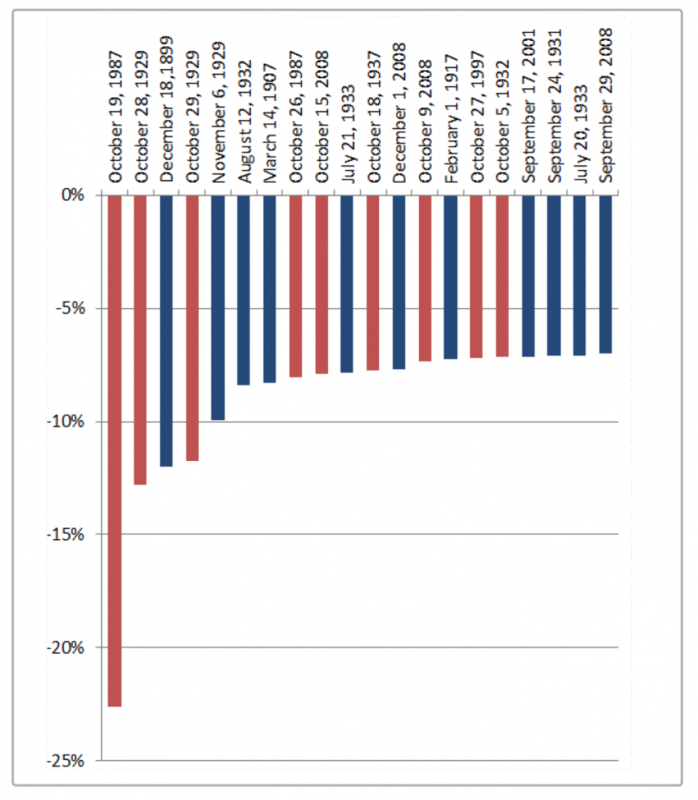 The chart below shows the seasonal chart of the SPX in mid-term election years over the past three decades. As you can see, the market typically declines into October 9, after which a powerful seasonal rally begins. In the 7 mid-term election years since 1990, the SPX delivered a powerful end-of-the-year rally 6 times. In the only losing year 1994 it posted a mere 0.02% loss. The SPX pattern in 2018 to date looks almost like a mirror image of the “normal” seasonal pattern in mid-term election years. Somehow it seems unlikely that it will deliver the typical seasonal strength at year-end, which normally tends to begin from “oversold” levels. Not only does the 2018 pattern so far look like the exact opposite of the typical mid-term election year pattern, but the markets are also faced with a large reduction in central bank liquidity injections from October onward (“QT” by the Fed increases to USD 50 billion per month, while the ECB is cutting QE in half from EUR 30 to EUR 15 billion per month). This suggests that there is a strong possibility that the pattern will continue to run opposite to the usual seasonal trend this year. Dimitri Speck specializes in pattern recognition and trading systems development. He is the founder of Seasonax, the company which created the Seasonax app for the Bloomberg and Thomson-Reuters systems. He also publishes the website www.SeasonalCharts.com, which features selected seasonal charts for interested investors free of charge. In his book The Gold Cartel (published by Palgrave Macmillan), Dimitri provides a unique perspective on the history of gold price manipulation, government intervention in markets and the vast credit excesses of recent decades. His ground-breaking work on intraday patterns in gold prices was inter alia used by financial supervisors to gather evidence on the manipulation of the now defunct gold and silver fix in London. His Stay-C commodities trading strategy won several awards in Europe; it was the best-performing quantitative commodities fund ever listed on a German exchange. For an introduction to the Seasonax app and in-depth information on what the app can do click here . Furthermore, here is a complementary page on the web-based Seasonax app , which costs less and offers slightly different functionality (note: subscriptions through Acting Man qualify for special discounts – for both the Bloomberg/Reuters and the web-based versions of the app! Details are available on request – simply write a note to info@acting-man.com with the header Seasonax! ).